The impurities that retain their magnetic properties when added to a normal metal strongly scatter the conduction electrons. The scattering of this sort in a bulk conductor causes at low temperatures an abnormal rise of resistance for metals known as the Kondo effect [Kondo (1964)]. The classic Kondo alloys consist of noble metals Cu or Au with a small amount (≪ 1%) of impurities as Mn or Fe. 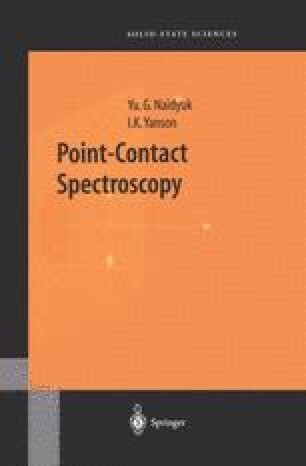 Point contacts are proved to be a very sensitive probe for detecting of the magnetic impurities in a metal. This was already mentioned in the first point-contact measurements by Lysykh et al. (1980) with Fe embedded in the Cu host. In reality, when adding only 0.01% of iron or manganese atoms to gold or copper, the point-contact spectrum displays distinct additional features at low voltages around 1 meV (see Fig. 6.1), which are connected with the electron scattering by localized magnetic moments as was shown by Jansen et al. (1981) and Naidyuk et al. (1982). The number of impurity atoms getting into the contact area can be evaluated at the above-mentioned concentration c = 10−4. The total number of atoms in a constriction with the size d will be d 3 /v, where v is the unit cell volume. Then the number of impurity atoms n i is estimated as cd 3 /v. Taking for a copper v ≃ 10−23 cm3 and the contact size d ≃ 10−6 cm for a typical resistance of 10Ω, we obtain n i ≃ 10 atoms. It is of interest that a point contact contains a meager number of atoms, the effect of which is, however, noticeable in the measured characteristics. Thus, we can say that PCS is a unique method for studying of electron scattering by a few microscopic centers.